Web design has come a long way in the past 20+ years. So what’s been the biggest change of all? They’re finally designed for the user. UX principles help make sure that our websites are accessible and a delight to interact with. But as we all know, it wasn’t always like that. With that in mind, let’s journey back to a time before user-centered design principles and the Nielsen Norman Group. 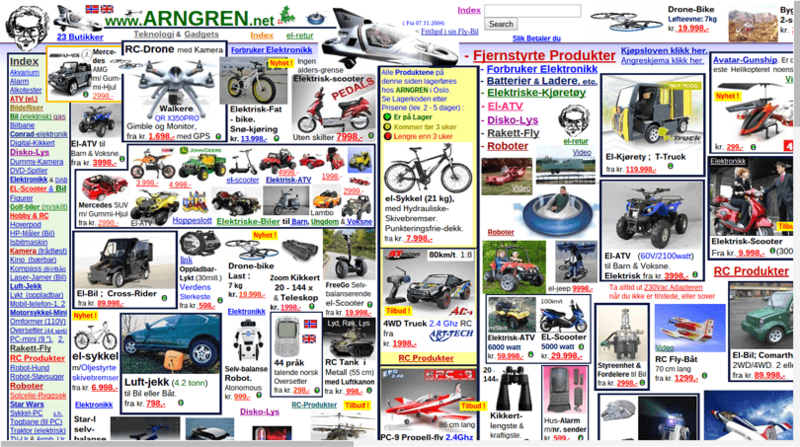 In our post, we take a look 10 of the worst websites of the 1990s ever to be designed. Cue the laughter! Penny Juice is a fruit juice concentrate for kids. Although the Penny Juice website has since been updated, we’re looking at the site circa 1999. On entering the 90s website, visitors are prompted to choose which version of the site they wanted to view: HTML or Flash. If you choose Flash, you’re greeted with a menu and an interactive background with floating clouds, spinning coins and animated words. Reviews are split up into garishly-colored blocks of all-capitalized, Times New Roman text. And check out that Comic Sans text bubble in the top right-hand corner. We can feel our Design Lead’s eyes on us as we write. If you need some font inspiration for your own website design, check out this post. We give you Arngren. The most shocking thing about this 90s website is that it’s still around. Is it catalog, directory or some kind of online store? Who knows? To anyone looking for something in particular on this site, we salute you. You can browse Arngren’s content by scrolling both vertically and horizontally. But hold on a second. With the thousands of cut-and-pasted low quality images and blue and red hyperlinks, trying to find anything on this site is next to impossible. This is Sixties Press*. As James Duval rightly points out, this site looks like it was designed by a six-year-old in 1995. 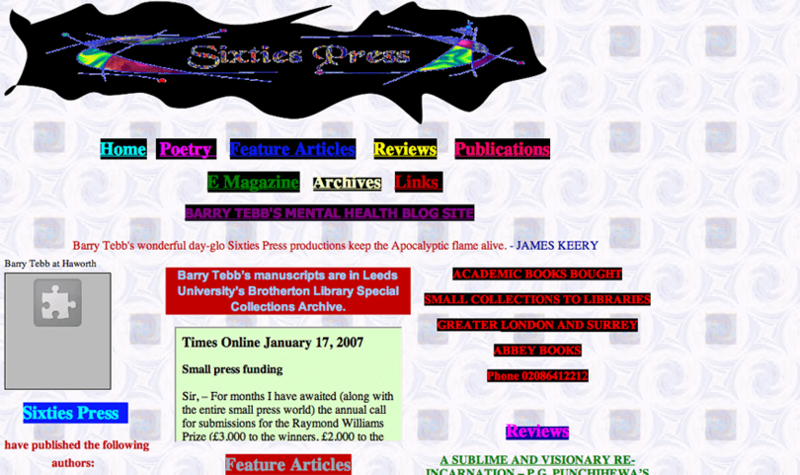 It was actually designed by English author Barry Tebb, whose intention for this 90s website was to promote and sell poetry books. We can’t imagine he sold many. Let’s take a look at the site’s Homepage. The header features a 90s-themed vector set on a questionable, squiggly black shape. The background is no better – a dated two-dimensional symmetrical pattern that looks like it’s been borrowed from a cult culture blog. Finally, let’s talk about the navigation buttons, all with brightly colored text and again that black background. But who needs buttons when all of the site’s content is displayed on the Homepage? *This version of Barry’s site is no longer around. And good riddance! Take a look at the new and improved site here. 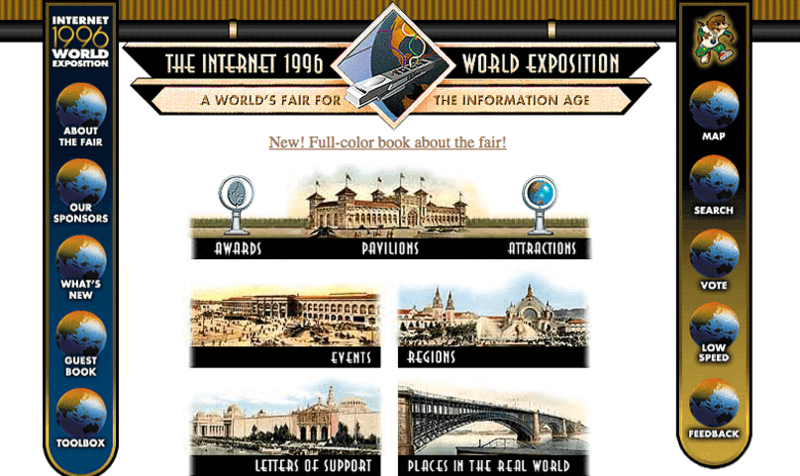 The Internet 1996 World Exposition is a sort of encyclopedia of Internet history from 1996 for artists, engineers and corporate executives. With a huge amount of subpages, this 90s website is fount of knowledge. As for the site’s decor, we’re not convinced. Let’s start with the Game of Thrones-style vertical navigation bars. Whose idea were the duo-tone banners of different lengths? And the same icon for each navigation destination? Rookie mistake. Next up, fonts. You’ll find a mash up of of Times New Roman, retro Art-deco and Arial, as well as upper and lower-case. -1/10 for readability for this 90s site! Learn more about making your site readable here. Aliweb is considered the world’s oldest search engine. Search for your content via the Search bar or via the categories provided below. There’s nothing particularly wrong with this 90s website, if you’ve got your magnifying glass handy. Lines and lines of small-text category links are broken up by red vertical bars, set against a garish yellow background – a real treat for the eyes! Thank goodness for the Reddit redesign right?! 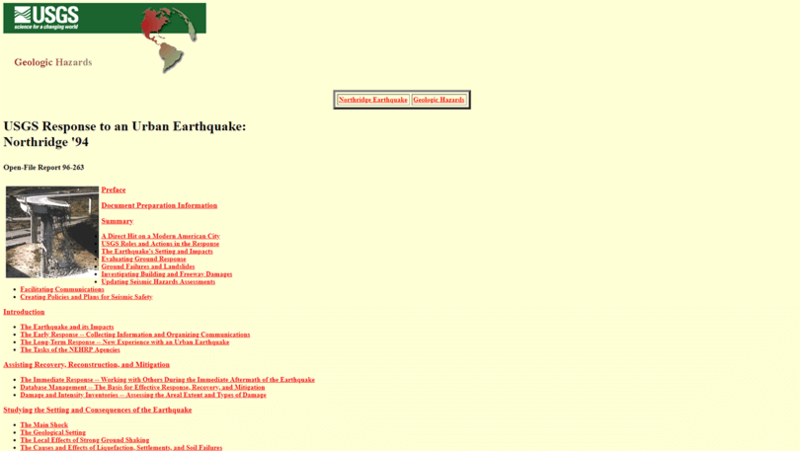 This is a page taken from the United States Geological Survey website in 1994. The first thing that catches our eye is the amount of red links on-screen. UI designers, if you don’t know how web accessibility works, it’s time to get educated or go home. As our own Cassandra Naji reminds us, “usable hyperlinks are the essence of good user experience”. Links need to be instantly recognizable to be readable. For instance, the color red is used for warnings and errors, and should never be used to visualize a navigation link. Blue remains the color with the strongest perceived affordance of clickability. 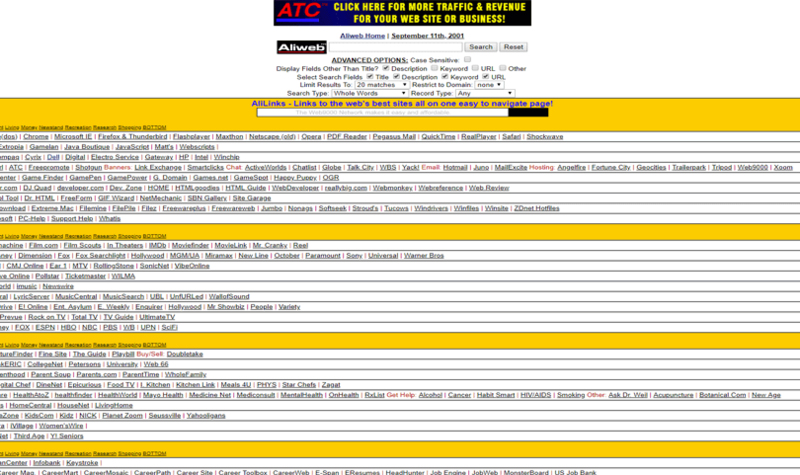 The layout of this 90s website is another usability killer. USGS’ over-zealous use of bulleted links combined with the all left-aligned content (classic 90s single-column text) is making us squirm. Moving on! Ok folks, we’re onto the big leagues now. Hello Amazon 1995, you beautiful disaster. 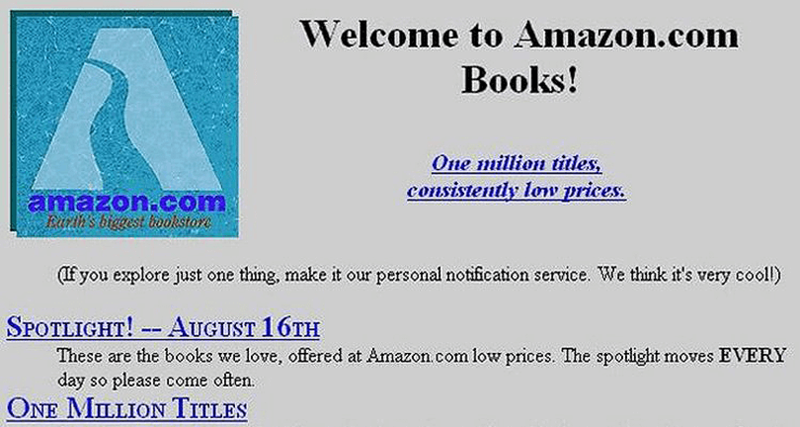 Way back before it become the world’s go-to eCommerce site for everything and anything, Amazon was a bookseller with a much more basic approach to web design. Before the mega menus, interactive carousel and search bar with a drop down, Amazon.com didn’t look much different to any other 90s website. We can’t take our eyes off that hyperlink in italics though – what a specimen! And personal notification service – tell us more! Also, note the old Amazon logo. It features a snaky, river-like path over a stylized letter “A” on a faux marbled background. This relic was put to bed in 2000, making way for the famous Amazon.com with a curved arrow beneath it. The site is also rocking the old Apple rainbow logo (1976-1998) – which was awesome. 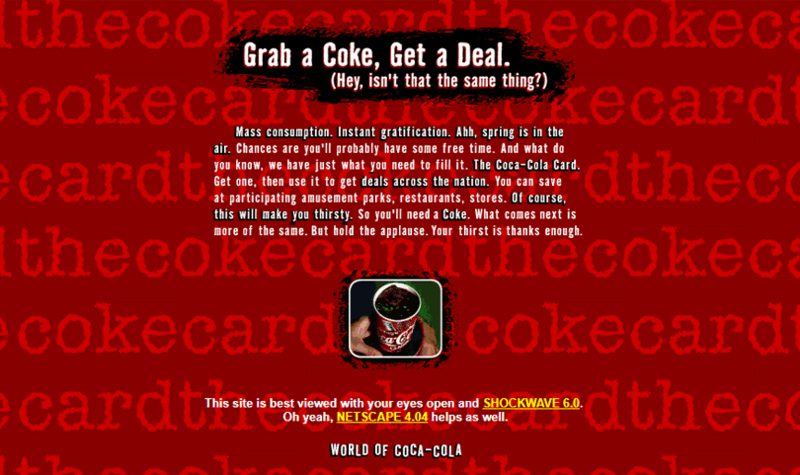 While its crimson background reminds us a little of the KFC food packaging, the 1999 Coca-Cola website is anything but tasty. The interactive version of this site is no longer available. But judging by the static version of this 90s website you see before you, you can probably imagine what moving version of this theme would look like. Also, where’s the logo? A teeny-tiny image of a hand grasping a cup of Coke isn’t exactly what we’d call branding. Oh well, at least the text is center-aligned! Last but not least, we have the 1996 Disney site. We’re drawn to the site’s double bottom navigation system – a must-have navigation system for 90s websites. On the one hand you’ve got your whimsical wave of navigation links. On the other, you’ve got your bottom navigation bar, which looks a little odd with its links displayed in that brown/maroon color. 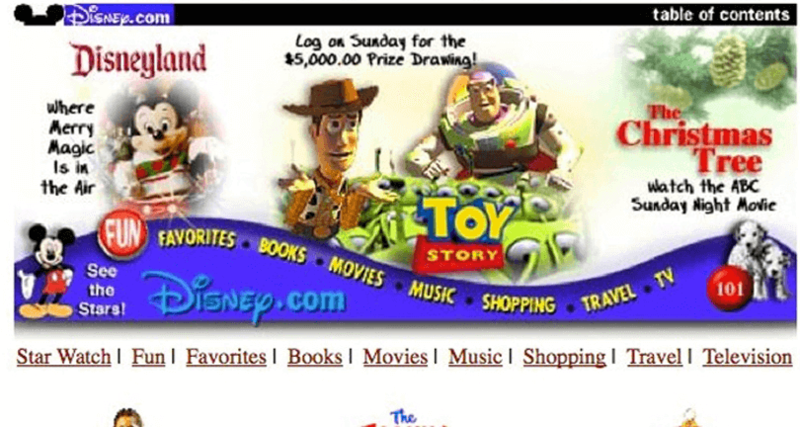 Disney also seems to have gone all out on fonts in the 90s, employing over six different fonts just for the Homepage! And yes, we are the logo police. Check out poor Mickey Mouse! 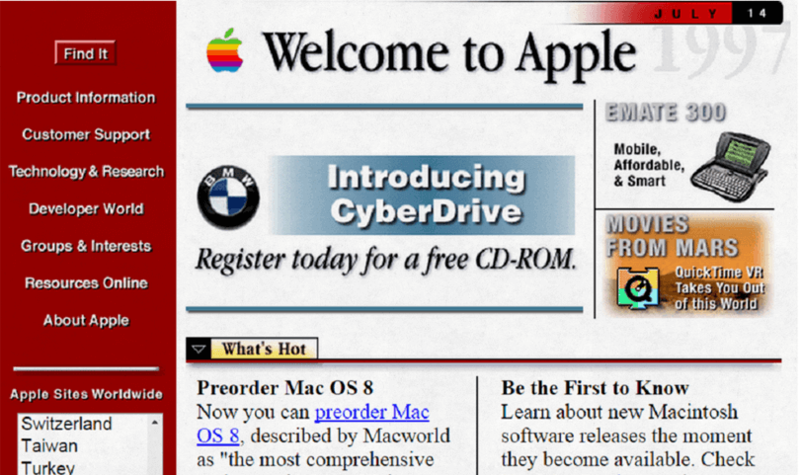 These vintage 90s websites are truly awful. But what can we learn from them? Well, technology is always evolving, and our websites need to reflect those changes. As a designer, you need a well-defined process to redesign a website. If it’s not already, your website needs to be content-first to provide the best UX. The primary goal of any website it to deliver valuable content to its audience, to help them complete a goal. Use a prototyping tool to help you visualize your design and validate your design assumptions with real users. 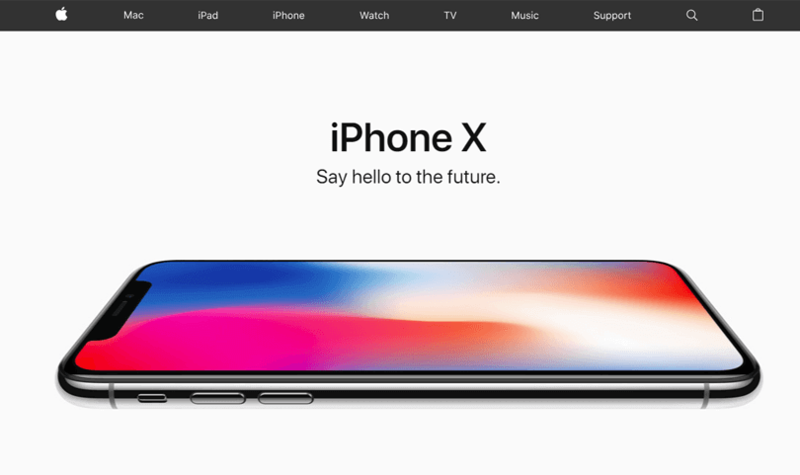 And if you’re looking to redesign your website, this UXers survival guide to website redesign post should be your next read. Good luck to you!